This might be indirectly linked to the ongoing SAARC debacle. Also happens to be my pet peeves-i.e bad landscaping. yeah it's my livelihood-i mean good landscaping. Anyway, when I was in Dhaka a few months back I saw the beautification projects throughout Dhaka in full swing. At first I though -what a marvellous endeavour- we are going to have all these new trees and plants and the concrete is going to be tamed for good. No and unfortunately, i left with a dim view of what was going on. Although you had to praise a noble effort, it was the sheer lack of common sense that struck me as ponted out in this DS feature. It was just another evidence of the "outward" gestures that seem to be takjing shape in every facet of BD society. It also seems like the powers that be want to copy wholesale what they see in Singapore and Dubai, but fail to appreciate or value what we have in Bangladesh-a land with probably the best soil in the world . A natural condition as a result of the delta geography that can only be denied by colossal ignorance.. But on the bright side - it is heartening to hear more and more concern about the environment which is gaining ground back in BD. Many rue over the fact that Dhaka has changed in just the opposite direction. "It was a beautiful green city, sometimes easily mistaken for a village," Bartly Bart wrote in his book, Romance of an Eastern Capital, in 1914.There is little romance left in today's Dhaka. There are no immediate plans, let alone cosmetic jobs, which may revive some of its lost character. Islam believes that there are two concepts regarding such beautification projects; one that thrives on a 'deliberate natural look' and the other that is 'ornamental'. It is the latter that is currently being implemented in Dhaka. As for his belief in total planning, Islam argues that the British Dhaka that consisted of Nilkhet, Ramna and Baily Road is the testimony to how beautiful a planned city can be; the Ramna area still is the most functional and visually interesting part of Dhaka. "It was during the early 1900s that areas were developed and 'permanent trees' were planted in clusters and on roadsides. Scopes for wider road as well as pedestrian pathways were also planned. After 100 years the trees are still standing. I don't see these kinds of permanent plans in the DCBC project," he points out. Edited on, February 3, 2005, 8:17 PM GMT, by oracle. Its a start. 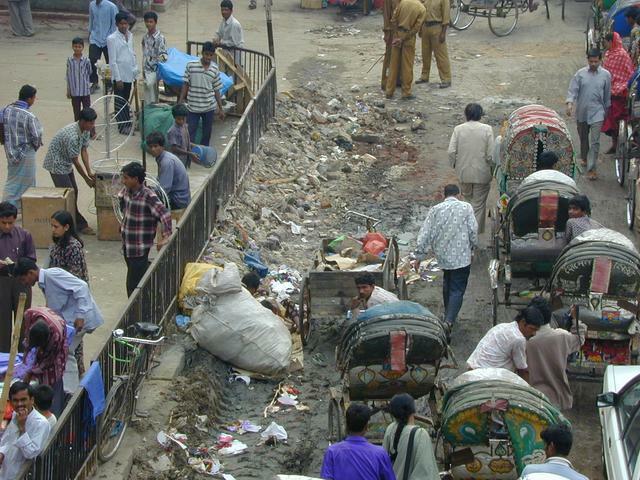 I for one can't wait for my next trip to Dhaka to check out the new "beautified" city. Its better to do something rather than nothing. I guess its in our bengali blood to complain about everything. Nothing is more grotesque than the juxtaposition of a bosti and a supposedly "beautiful" steel structure/cosmetic job in the same city. Edited on, February 4, 2005, 1:50 AM GMT, by Arnab. Seriously, all Dhaka needs to make it look nice is a good clean! What's the point of having beautiful things if they're dirty? speaking of the environment, if you look at aerial pictures of dhaka since 71 you will be startled, but not surprised, to see the dramatic decay of greenery. a large part of this is the everyday construction of homes and commerical buildings - building codes for the amount of land that must be left between the structure and the boundary are laughable to begin with and in any case not enforced - resulting in structures that are built all the way to the edges of every piece of land. And in the process we lose any trees that are left. Multiplying that throught the entire city has brought us to where we are now. Thanks AGC for the aerial pics- lost touch with skyscraper city website for a while now- and i see that they have removed the Bangladesh forum. Edited on, February 4, 2005, 8:03 PM GMT, by Arnab. Ooooh.....its stunningl....never thought Dhaka is so Beautiful..
Edited on, February 5, 2005, 3:53 AM GMT, by nasifkhan. I think It's important how Dhaka's population feel about their city. Cosmetic beautification won't help as long as its population lack 'civic sense'. Dhaka, one of the most populated city in the world, would never function properly if they don't diversify medium/level of transportation. Only overground transport links would not hold the city together in near future. Not advocating for underground for hugh cost attached to it, but mono-rail on series of free standing single columns ( something like Docklands Light Rail) should be introduced sooner than later. Now Dhaka's new architectecture. There are sporadic good designer's built architecture .i.e. Boshundhara City (designed by vitara- Polash), and most of Uttam Shaha's apartment buildings. But any trained architect (from any part of the world) may fail to relate Dhaka's new architectural development with anything - modernist, neo-classic, post modern or what not. But lack of planning guidelines or lack of interest to implement those, coupled with lack of aesthetical sense of living, may result such hotch-potch architecture such as Roman tapered column holding glazed steel front elevation or steel clad facade. blimey! Though there are some well designed building like Navana tower at Gulshan 2 circle. Btw, Parliament building at Sher-e-Bangla Nagar, designed by L.I. Kahn, is one of the most beautiful building on this green planet. You ask any trained architect and they will tell you. Footnote: It's been claimed that Kahn didn't get part of his design fee (today's value US$60,000) as I recently found that out from a documentary on Kahn (produced by his son who is also an architect) . Edited on, February 5, 2005, 2:55 PM GMT, by Zephaniah. BTW- Mazharul Islam should also get credit for the parliament bldg. He started it all in BD. Hats off to him. Probably my fave is the fine arts bldg in Dhaka campus.Perfect for our climate and cheap to build too. The parliament bldg is great but do you know that the marble and the wood is all imported- something you should'nt encourage. Edited on, February 5, 2005, 3:10 PM GMT, by oracle. Oracle. Mazharul Islam is cool. I liked his fine arts buildings (design somewhat inspired by Le Corbusier) and also seen masterplan (only drawings) of Chittagong Uni which is nice. Mr. Islam was , if I remember correctly, the chief Architect of combined Pakistan PWD. So it was part of his job responsibility to do initial feasibility study and he soon realised its beyond his capability to design a 'city scale' parliament building. We all appreciate his honesty and commitment for 'built as ruined' architecture. As for imported marbel and wood, main structural form of the parliament building are platonic solids with concrete forming the outer skin. Marbel used as horizontal bands to scale down the whole monumental building a bit. Only in Interior you can see wood finish. I would say for a project of such scale, the amount of marbel and wood he used is really a trivial matter. He was keen to use local material though as you can see all other buildings around the main parliament building (i.e MP hostel, few other admin buildngs and 'that' hospital) are made of sun burnt brick. In my last post I only pointed out 'new Architectural development' (I should say contemporary though).That's based on my observation when I last visited BD in 2001. Mazharul Islam and 'that guy' ( met him, but I forgot his name...clue - he's contemporary or little younger than Mazu, designed so many nice residential buildings, his wife is/was a professor of English dept. DU, and he retired when he failed to secure commission of BD embassy in Delhi due to political reasons) were more context driven designers opposed to contemporary designers in Dhaka. What's the point of having beautiful things if they're dirty? ok im sure u didn't mean it like that... did u mean the fact that its overcrowded? while on the subject of areal photographs... i have 3 friends who went to school with me (I finished school last yr and starting uni this yr) who took areal photos of Sydney for their Geography assighntment... they also took areal views of the school... and most ppl didn't know wat was goin on (they did it in school time). btw.... they actully flew the planes themselves. LOL you misunderstood me. I mean how the streets, buildings, water features etc in general are unkempt. For example, it would be much better to have no water feature instead of having a one with green algae and various other nasty things floating in it..
By the way, anyone know how Dhaka looked when it was 'cleaned' for Clinton? It wasn't cleaned for Clinton. Clinton barely visited anything in BD. He cut his tour short for fear of terrorist attacks. I don't know how many of you know this, but most of these projects are sponsored by tobacco companies. But then again, I might probably be the biggest anti-cig person on this board. Frankly speaking.. all the meager efforts that has been taken to improve Dhaka visually as well as environmentally has competed with the huge and fast-growing populatin/infrustructural growth of Dhaka.. and, to say honestly, has really failed in trying to do so. Probably, the issue of saving Dhaka's livable environment has already become an alarming issue.. and Dhaka's air/waste management/human settlement hygene overall has become so very toxic & unmanaged!! Chittagong is another large city of BD... and anyone see the far better natural environment it has got compared to Dhaka. Trust me... I loved that city!! Ratio of Residential/Industrial/Other development vs. green areas/breathing spaces has already failed in Dhaka... and it's really scarey to think about what is coming ahead in our very near future! Unfortunately... BD govt.(all.. in the last 33 years) has always been taking the issue of Dhaka's environmental developement too very lightly, producing these sort of 'Fruitless' projects.. which only aim to HIDE the 'near-to-failure' system's inner disarray. The policies have been going all so wrong.. like all other sectors of the country! Edited on, February 7, 2005, 12:12 PM GMT, by crickethorizon. Good that they are giving the effort of beautification of Dhaka City mainly the roads from airport to Banga Bhaban and other places of high importance. i was in dhaka at the time. yes, the air port road and, as a matter of fact, the whole route to wherever he was taken was cleaned and all sorts of traffic were blocked. Clinton saw a completely clean, poverty free, sparsely populated dhaka on his short visit to BD. then there were these school kids on both sides of the streets with banners and stuff - waving as he passed. that was so lame. and our ministers were reluctant to let go of clinton's hands when they were shaking. in fact they had both hands wrapped around his right. Maybe being so patronizing is not so good - after all, our leaders have not had the same benefit of your Western education and exposure. Considering Clinton's image, people were all over him either in awe or to back stab ! And school kids being on road sides is a practice as old as Bangladesh itself.